Events – Alliance Title & Escrow Corp. 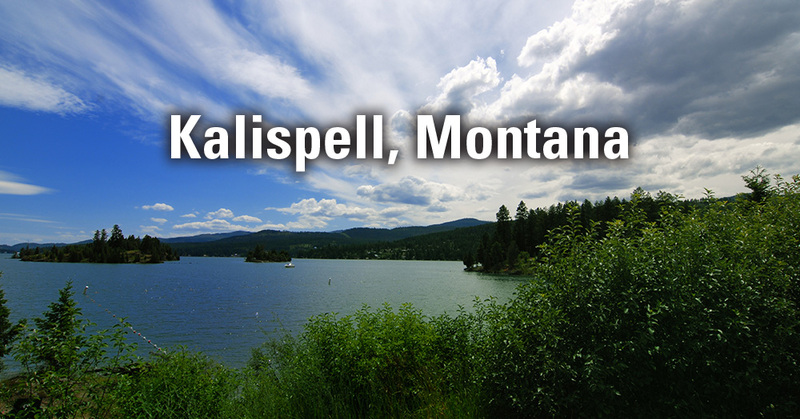 Most people are surprised at the beauty and wonder that Kalispell, Montana offers. At the center of the Flathead Valley, this mountainous getaway is surrounded by Flathead Lake and Glacier National Park – offering plenty for the adventurer. Alliance Title’s Kalispell branch is just south of Woodland Park, and is only a mere 40 minute drive from the national park. 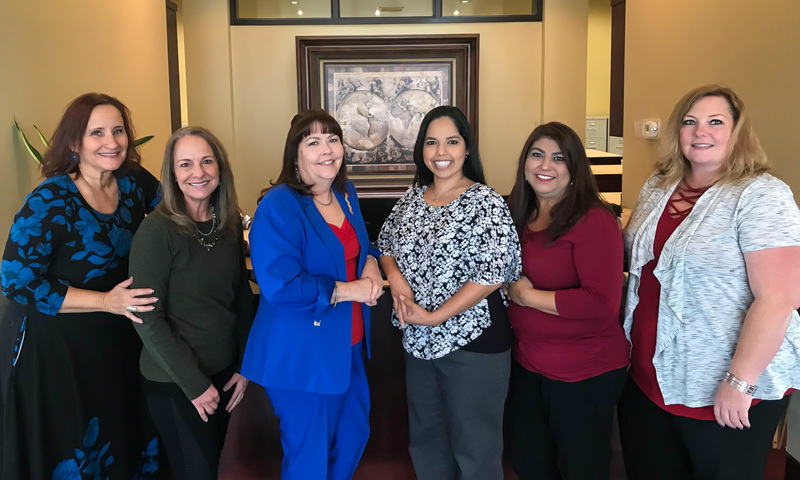 The office staff ranges from Millennials to Baby Boomers – with a combined knowledge of 130 years in the title and escrow industry! The branch is a longtime supporter of the Flathead Building Association, the Northwest Montana REALTORS® Association, the Kalispell Chamber and the Whitefish Chamber. The team is currently new supporters of the Glacier Symphony, the Flathead Valley Community College Foundation, Tires for Change, and Flathead Area Young Professionals (FAYP). The Kalispell team has a lot of fun and isn’t afraid to get outside of their comfort zone. Each fall, the team throws a community party – depending on the date, a Halloween or an Oktoberfest party takes place. However, costumes are always a must! Whether you’re buying or selling commercial or residential property in Flathead County, the professionals at Alliance Title’s Kalispell location are thrilled to help make your next transaction a success! 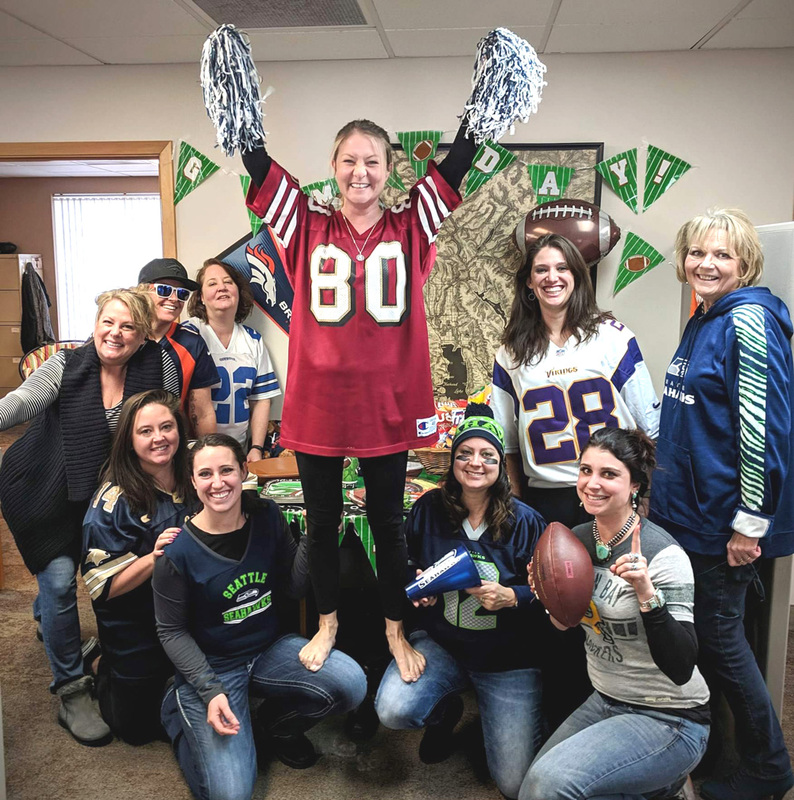 Kalispell branch having fun before Superbowl 53! 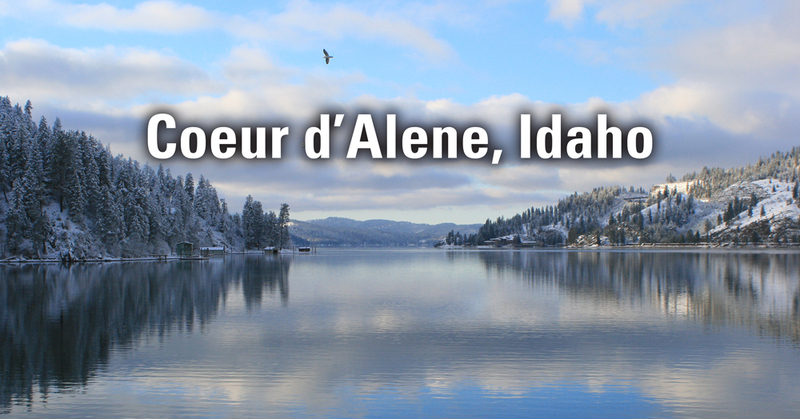 Posted on January 17, 2019 by Alliance Title & Escrow Corp.
To understand the magic of Coeur d’Alene, one must visit the eclectic Northern Idaho city. Surrounded by dozens of lakes created from ice-age glaciers, Coeur d’Alene offers a plethora of recreational activities for any season – as well as jaw-dropping sunsets. Alliance Title’s Coeur d’Alene branch sits across Riverstone Park and is a skip away from Lake Coeur d’Alene. The team is heavily involved in community activities and events – they support St. Vinny’s each year with their concert event in the park, Coeur d’Alene’s local college NIC, as well as supporting CASA, the Women’s Shelter, Children’s Village, Boots and Socks through Windermere, Coeur d’Alene Association of Realtors, the local police and fire department, and the Post Falls Chamber of Commerce. The CDA branch has an incredible group of professionals who desire to help and go above what is required for their customer base. With a combined work experience of 305 years in the industry, accuracy and a timely nature come naturally to this crew. Each October, the team hosts an Open House that the community is invited to. With a turnout of 250 guests this past October, the CDA branch was especially appreciative of their guests and clients who participated in games, danced to live music, and ate delicious catered barbeque. When they aren’t hard at work, each employee finds time to relax and unwind. From Noodling – catching large fish with bare hands – to tight wire walking, attending mosh pits at rock concerts, acing spelling bee contests, and powerlifting, this team includes quite the adventure seekers! Whether you’re buying or selling commercial or residential property in Kootenai County, the professionals at Alliance Title’s Coeur d’Alene location are excited to help make your next transaction a success! 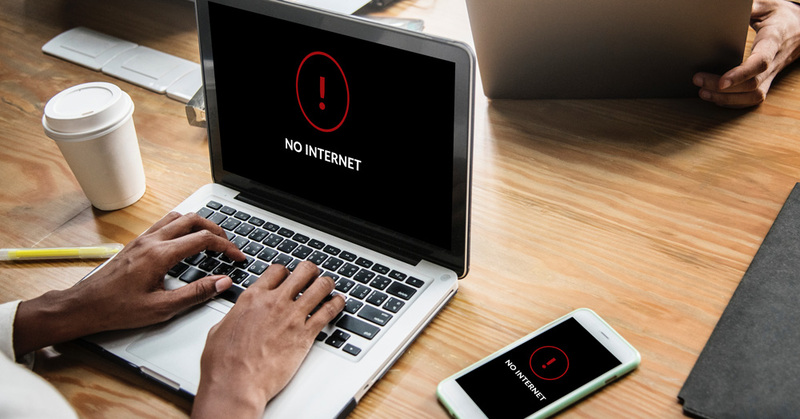 The following Alliance Title offices that were impacted by the CenturyLink nationwide internet outage yesterday have been restored! Thank you for your patience and understanding. We’re happy to assist you and your real estate transactions! 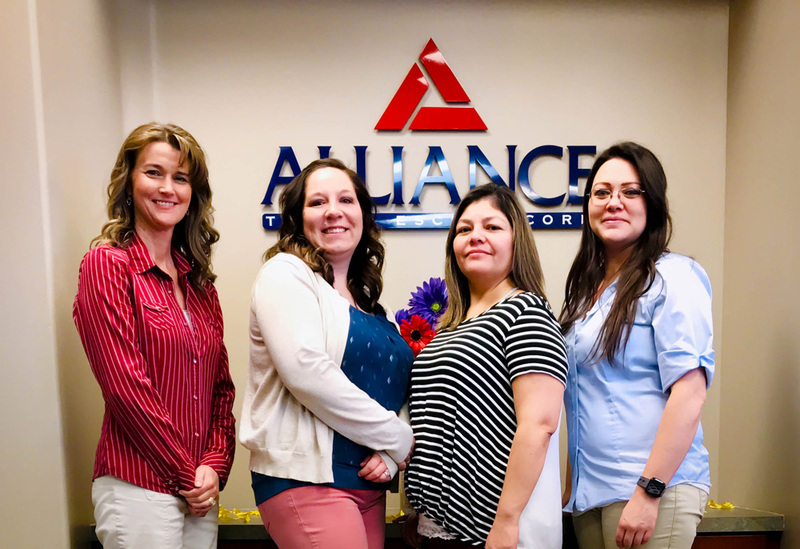 Alliance Title’s Pocatello branch not only contributes to the community of this historical town, but the employees also deeply care for and appreciate their clients. Working with their clients gives them the opportunity to create new friendships – each customer brings something different and new to the table; they teach the branch something new and are always cheerful. 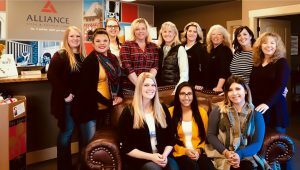 With a combined work experience of 103 years, the Pocatello team is experienced in serving your title and escrow needs. Their innovative problem solving techniques and dedication to community service pushes their team to stand out above the competition. In the community, the branch contributes to food drives, the Rotary, Chamber of Commerce, Local Land Trust, Valley Pride, Junior Achievement, the Legislative Council, and the PR Committee. Their branch is also military strong – both Emily Geisler and her husband, Jayson, served in protecting our freedom. The Chamber of Commerce also recently awarded Lisa Armijo with the Distinguished Citizen Award this past year. When the team isn’t hard at work, they enjoy spending time painting, cooking, silversmithing, gunsmithing, horseback riding, bodybuilding, hunting, hiking, traveling, 4-wheeling, and participating in marathons. Whether you’re buying or selling commercial or residential property in Bannock County, the professionals at Alliance Title’s Pocatello location are excited to help make your next transaction a success! 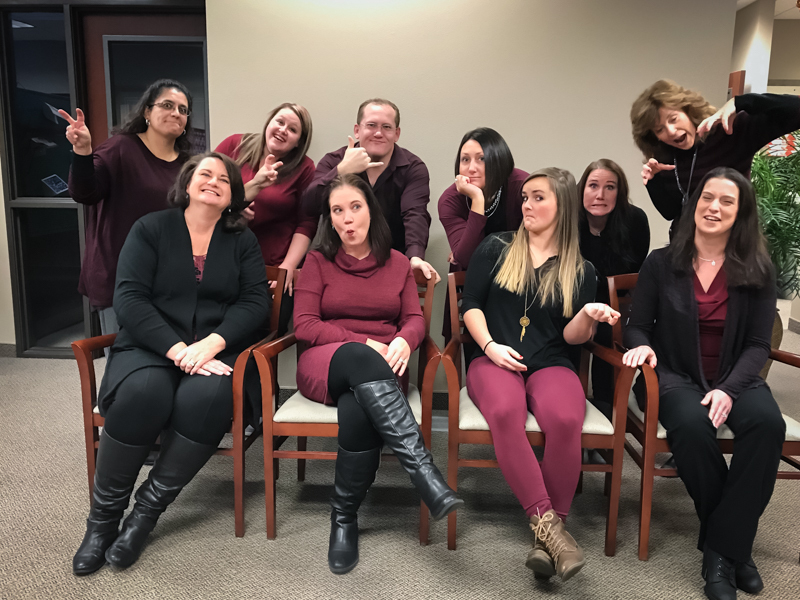 The Alliance Title team located in Nampa, ID has an incredible group of experienced and talented individuals who will not only help you through your next real estate transaction, but who also know how to have fun! Each employee has become an invaluable member to the team and rounds up almost 75+ years of experience in the industry. 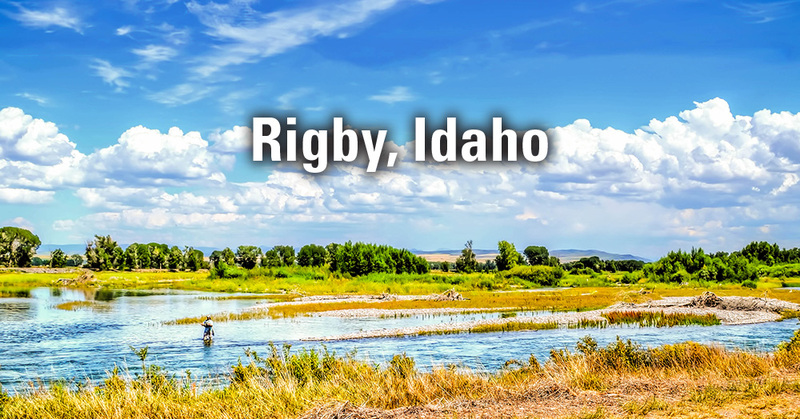 The Nampa branch is both family and community oriented; they take pride in every level of service – from greeting customers, to completing transactions at the closing table, and presenting a unified and consistent high level of customer service. While this branch is wonderfully committed to each client, the employees in the Nampa branch are also unbelievably active in the community. The Nampa branch participates in “Festival of Trees,” The Boys and Girls Club, and the companywide food drive, “Closing the Hunger Gap.” Their office was also able to gather $3,200 from their “Sporting Clay” event, where they were able to fund the cause, “Stampede for the Cure” – a charity that helps local women receive free mammograms. The Nampa branch holds this event every year, with proceeds contributing to new charities. Each and every employee brings a diverse array of talents and hobbies! From gardening, cooking, baking, sewing, crafting, painting, furniture building, refurbishing and antique restoring – this team is involved in almost everything! 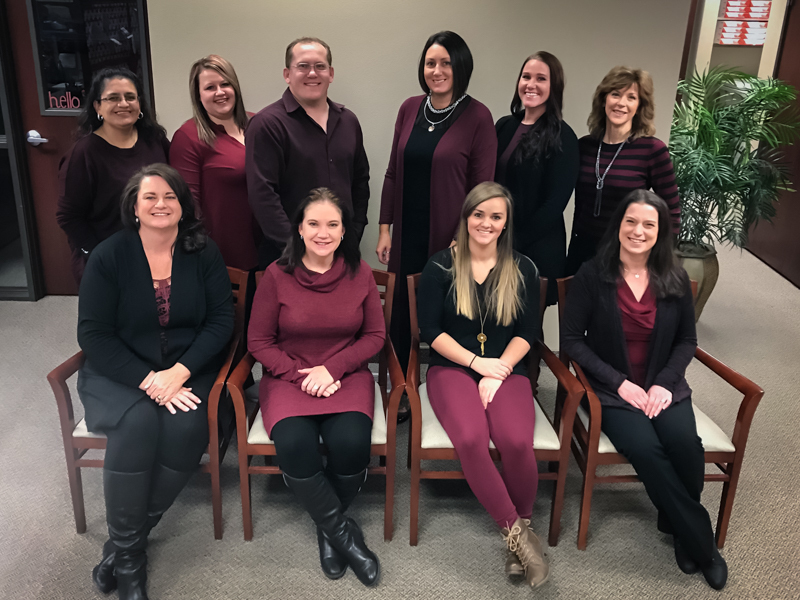 When asked what they loved most about their customers, the Nampa team all echoed in unison: “our clients become like family.” Clients aren’t just business partners, but friends – they share the branch’s passion for community and work with them to support and serve others. Whether you’re buying or selling a commercial or residential property in Canyon County, the professionals at Alliance’s Nampa location are excited to help make your next transaction a success! Get Ready, Get Set, Vote! 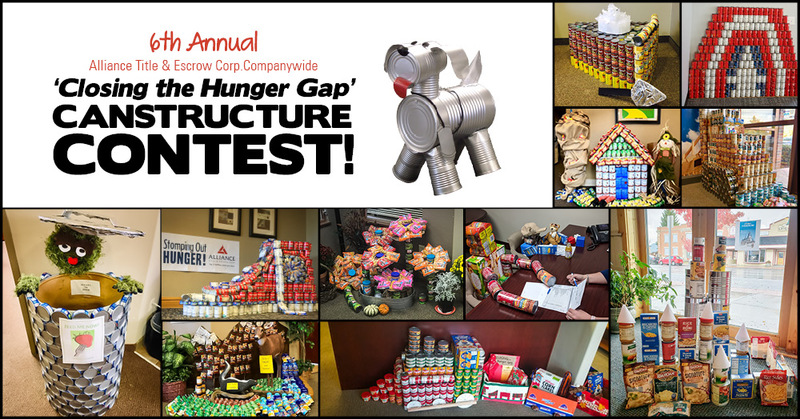 Alliance Title’s 6th annual Canstructure Contest has begun! Follow the link below to vote for your favorite canstructure. The winner will be allowed bragging rights, and the Fido Traveling Canstructure Trophy! 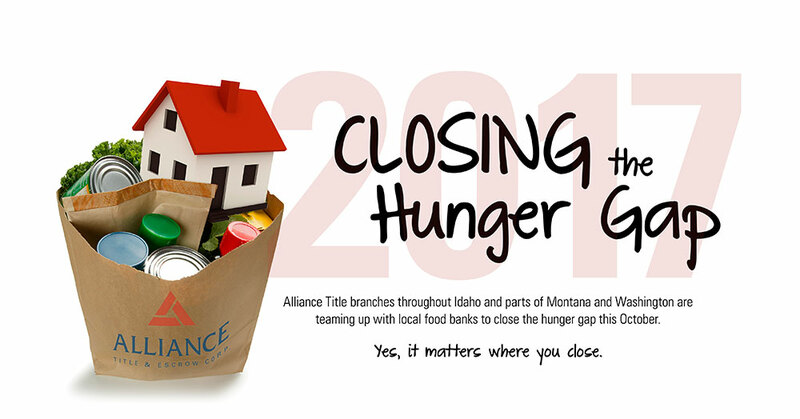 Get voting – and help Alliance Title close the hunger gap by donating nonperishable food items to any Alliance Title location throughout Idaho, Washington, and Montana. We’ve officially kicked off the 7th annual Alliance Title & Escrow Corp. ‘Closing the Hunger Gap’ companywide food drive! The drive will run through October 31st, 2018. Our branches throughout Idaho and sections of Montana and Washington have teamed up with their local food banks to collect non-perishable food items and funds to help end hunger in the communities we serve. This year’s goal is to collect 27,000 pounds of food. Each branch will be creating food art installations we call “Canstructures” – each office will come up with their own theme and design! Come into participating offices to vote on your favorite one, or vote for your favorite Canstructure starting on Monday, October 8th! We’re eager to have you help us reach our 27,000 pound food collection goal and end hunger in our community! Don’t forget to use the hashtag, #CHG2018 to share your donations! 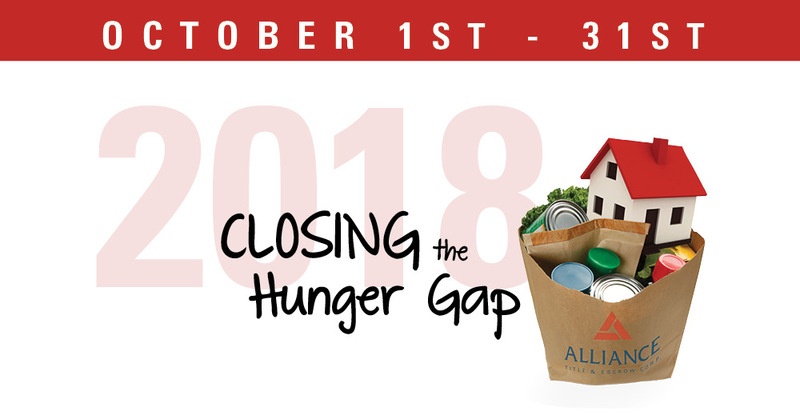 We’ve officially kicked off the 6th annual Alliance Title & Escrow Corp. ‘Closing The Hunger Gap’ companywide food drive! It runs from October 1 through October 31, 2017. Our branches throughout Idaho and parts of Montana and Washington have teamed up with their local food banks to collect non-perishable food items and funds to help end hunger in the communities we serve. This year’s goal is to collect 25,000 pounds of food. Last year, we collected 23,900 pounds of food in addition to $12,169 in employee and customers donations. Added to a portion of each branch’s revenue, totaling $27,425, the total companywide combined monetary donation was $39,594 and turned out to be the largest fund donation the company has made to date. Come into participating offices to see Canstructures built by that office and vote on your favorite one! What is a Canstructure, you ask? It’s a themed art installation made of non-perishable food items that will be donated to that office’s food bank partner. Vote for your favorite Canstructure on our Facebook page! We’re excited for you to help us reach our 25,000 pound food collection goal and end hunger in our community!